A good quality bicycle pump should be part of every cyclist’s armoury. The last thing that you need when you are out on a long trip is to end up with a flat tyre. Having a pump on hand can make or break your cycling experience. With a plethora of different pumps available on the market, it can feel daunting trying to hone in on the one that is best for you. These in depth bicycle pump reviews of six of the best pumps will make it easy to select the best cycle pump for your bike. What to consider before buying a bicycle pump? Type: do you need a track pump? A hand frame pump? Or something different? The pressure and volume required for your tyres: more heavy duty tyres will require a more heavy duty pump. Gauge accuracy: is it very important that you can control the inflation and pressure of your tyres with hairsbreadth accuracy? Valve types: a valve that fits snugly over the valve on your tyre is a must. Size and weight: can your bike handle a heavy pump? Is the frame thick enough to accommodate the pump? Style: is it important to you that the pump looks good clipped onto your bike? Durability: will this pump last for several years? 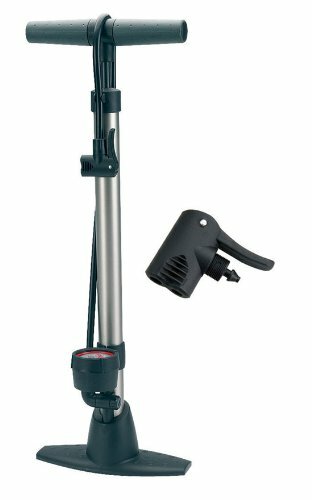 Information about all of these aspects of a bike pump can be found out by reading the manufacturer’s information. Alternatively, simply check out the cycle pump reviews below. What is the best bike pump? There is a pump for everyone in this collection. This is a sleek and professional looking pump that nevertheless is one of the cheaper items on this list (clocking in at just under £18). Its key selling point is probably its pressure gauge, which has specially designed graphics for easy reading. Conveniently, it comes equipped with two different valves – a schrader valve and a presta valve so it can be used on different tyre types. Made of 35 mm of robust steel, this pump is light weight, though the horizontal pump handle may make it hard to fix onto your bike frame in a streamlined fashion. Like the Vandorm pump reviewed above, this offering from Beto comes with a pressure gauge, giving it a professional look even as it is cheap enough for amateurs to purchase without any qualms. Compatible with both scrader and presta valves, its handle is nicely padded with soft materials to ensure that pumping the tyre is not too hard on your hands. This is the lightest and most compact pump on the list, but it is also the most expensive so far, costing just over £22. Compatible, like the other pumps reviewed here, with both presta and schrader valves, it weighs just 3.49 oz – perfect for racing bikes! This pump has a classic look and feel – it has no pressure gauge (like the other two pumps reviewed above), but it evokes the traditional flexible cord-style pumps of yesteryear. Honed so that fewer pumping strokes are needed to fully inflate your tyres, everything about this pump makes life easier. Here, we have the cheapest pump on the list: this light and slender little pump costs only £7 on average. Use the velcro strap to secure this tiny pump to your bike frame and you will hardly notice it as it weighs just 91g. Though it cannot cope with heavier duty tyres, this slim and extendable pump (which is compatible with both valves) is ideal for cyclists who are conscious about the overall weight of their bike. Costing less than £10, this is the second cheapest pump on the list. Though it does not have any special features such as an easy ready gauge, it does all that you want a bike pump to do. Compatible with both valves, and easy to activate with one hand using the thumb lock, it may look a little chunkier than the Pro Bike Tool option reviewed above but it is very easy to affix to your bike using the built in mounting brackets. Great value for money. This is a floor pump, and so it is not designed to be strapped to the frame of your bike. Whilst this may be an inconvenience for some, this pump offers the best gauge on the list and also a high pressure (160 psi). Though it is the most expensive item reviewed here (costing £25.49), you definitely get what you pay for – this is a professional piece of kit. Whether value for money or the ability to deal with a high pressure is your priority, you will be able to find a pump on this list to suit you. Spend less than £10 for a good all round pump or pay extra to get an ultra accurate gauge. There are also plenty of very light weight pumps on this list, which is very useful if you prefer to travel light or use your bike for racing.